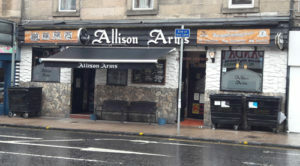 A recent excursion in the West offered an ideal opportunity to follow up tips from reliable sources that the Allison Arms in Glasgow was worth checking out. It may not look like much and it’s a bit of a trek from the city centre – a little further than the Laurieston – but I was delighted I made the effort. From the outside, it’s a traditional drab old boozer. Inside, it looks… well, nothing special. But looks can be deceptive. I thought it was really special, the kind of pub anyone would love to have on their doorstep. The welcome was wonderfully hospitable, the clientele remarkably diverse. While the draught beer selection is nothing to write home about – lots of West – the selection of bottles is terrific. There are three large help-yourself fridges – how trusting – on the rear wall: one with German beer and the others largely British. It’s an excellent, and unexpected, range. The British bottles are well-chosen, mainly Scottish, including some fairly obscure local brews. The German range is strong and modestly-priced. 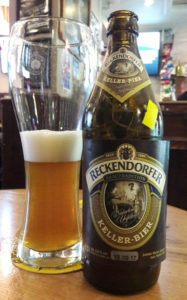 I started – and so did many of the locals on my visit – with the Edelstoff before the Reckendorfer Keller-Bier and the Schonramer Altabyrisch Dunkel. All were great – and just £4 – but I particularly enjoyed the burnt caramel flavours of the dunkel. The Allison Arms is a really outstanding boozer. 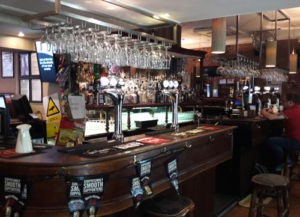 The beer is good, the atmosphere is fantastic and I would happily have stayed there all day. Near the Laurieston – another Lunchquest favourite – and many intriguing-looking restaurants, it’s a place worth seeking out. It’s a gem.